The days are getting shorter, the nights are getting longer, and we are entering what I like to call "flashlight season". Soon you will be arriving at work, or leaving, in the dark. Because of the dangers of the jobsite, one thing you don't want to do is navigate in the dark. The reasons to keep a flashlight handy far outweigh the excuses to not have one, so it would seem to be perfect timing for a flashlight review, and I have one for you thanks Coast. 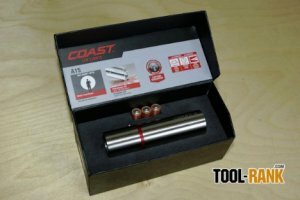 What Coast sent over was their A15 Professional LED AAA flashlight. Probably like most of you, I am not an expert in flashlights, but what we really care about is not what kind of LED is used or how many watts it is; what we care about is quality, usability, and performance. So how does the Coast A15 measure up? Let us start with design. The A15 has one of the sleekest classiest flashlight designs I have seen. I am a fan of simple and classic and the A15 fits the description well. The body is almost completely made of stainless steal, with a ring of red aluminum that adds a nice bit of pop. The light has a single output level that is activated by a small stainless steel button that protrudes from the body. Like I said, I like the design, but there is one thing missing. There is no hole in the body for us to attach a lanyard of some kind. While a lanyard would have been handy, the flashlight is so compact that there is just no room for one. It is just under 4-inches in length. In the case of flashlights, design is also function. One complaint I have of the light is that it can be hard to hold on to at times because of the smoothness of the metal. The same thing I find as a problem is also a feature Coast advertises. Because of the smoothness of the metal, the light is super easy to clean if it gets covered in grease or some other gunk. The build quality on the A15 feels really good, it is machined well and has a nice bit of weight to it. It looks and feels like it can take a beating. The performance of the light is amazing. The A15 is powered by only three AAA batteries, but it puts out 222 lumens of light, with a color that is similar to sunlight. Light measurements are hard for us novice flashlight users to understand, but a beam distance rating of 140 (almost 460 feet) meters is something we can more easily envision. Many flashlights on the market today can throw light a good distance, but are not very good at illuminating wide areas, but the A15 has a really nice feature that allows the light to do both. The feature, called Coast Max Beam, is essentially a double lens, where a percentage of the light is directed away from center to throw a wider cast. Ultra bright LEDs have a tendency to get hot and heat the body of the flashlight, while this is true with the A15, it never became uncomfortably hot. The specs on the A15 list total run time at 3 hours 45 minutes, which is actually pretty good for a light with this much power, though I have not yet had a chance to confirm this. I really like the looks, the compactness, the brightness, and most of all the Coast Max Beam feature of the Coast A15 flashlight. I feel the A15 is reasonably priced at $53 when you look at the brightness, features, and build quality of the light. Did I mention the A15 comes in a nice little box, and includes 3-AAA batteries and a small nylon pouch. If you are interested in this light, you can head over to the Coast website to find a dealer. Also, again thanks to Coast, we will be giving away one of these lights to a lucky Tool-Rank reader in October. So be sure to check back for details.